Republic Kazakhstan – the huge country in which territory more than 120 nationalities live. Kazakhstan is the unitary state with a presidential government which borders with such countries as: People Republic of China, Kyrgyzstan, Turkmenistan, Uzbekistan and the Russian Federation. It occupies territory with the area of almost 2724 thousand sq. km, and population exceeds 16 million persons. 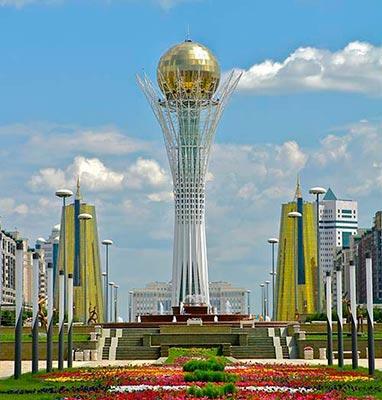 Capital of Kazahastan is the city of Astana, and national currency is 1 Kazakh the tenge, which is equal to 100 tiyn. National flag of Kazakhstan represents a blue rectangular cloth in the centre of which there is an image of the sun with 32 beams under which a steppe eagle proudly flies by. From the side of pole a vertical strip in the form of a national ornament passes. The main element of the National arms of Republic Kazakhstan is the shanyrak-top part of a dome of the yurta, having the circle form, whence in the form of sun beams supports – uiks extensively disperse. Whole of this is framed by wings of two mythical horses – Tulpars, which as though protect the shanyrak from influence from the outside. Distinctive feature of Kazakhstan is the unique combination of the east and the West, modern culture and ancient traditions. Besides, for 20 years after disintegration of Soviet Union, this country has managed to reach the big heights and to strengthen the positions in the world market.